On Saturday, August 8, 2009, just before noon a Piper Lance aircraft, PA-32R-300 collided in midair into the rear of a sightseeing helicopter over the Hudson River in New York City. New York Police Department's sent divers into the Hudson River searching for bodies in the vicinity of West 14th Street in Manhattan. New York City Mayor, Michael Bloomberg has said the accident is one that is "not survivable.'' "It has gone from rescue to recovery" Aircraft and helicopter debris has been scattered on the Hudson and Hoboken, N.J., waterfront. The helicopter was Eurocopter AS 350-BA, tail number N401LH. The helicopter was operated by Liberty Helicopter Sightseeing Tours. Onboard, the instrument rated pilot, Jeremy Clark, with a total of 2700 flight hours of Lanoka Harbor, N.J. and five tourists from Bologna, Italy; Michele Norelli age 51 and his son Filippo Norelli age 16, Fabio Galazzi age 49, Tiziana Pedroni age 44, and Giacomo Gallazi age 15. Michele Norelli was celebrating his 25th wedding anniversary his wife had stayed behind but their 16 year old son went along in the helicopter. "The trip was a gift from one of Norelli's sisters to mark the 25th anniversary of his marriage," Giovanni Leporati, a friend of the Norelli family, told the AP by phone. "The anniversary already happened but they took advantage of the August holidays and went." Liberty Helicopter Sightseeing Tours operates sightseeing excursions around the Statue of Liberty, Ellis Island and Manhattan at costs ranging from $130 to about $1,000. This Flight was the "Big Apple" tour a 12 minute flight. An eye witness reported he was looking up in the sky at the time and saw the impact, and said the helicopter dropped like a rock and that the aircraft had its wing torn off. Divers are having difficulty seeing in the water as the water is offering about 2 feet visibility. The National Transportation Safety Board dispatched a Go Team to investigate the midair collision. Senior NTSB Air Safety Investigator Robert Gretz serves as Investigator-in-Charge of the 10-member team. NTSB Chairman Debbie Hersman accompanied the team and serves as principal spokesperson for the on-scene investigation. Keith Holloway, NTSB press officer joined the team in New York. The Coast Guard and multiple agencies continued through out the Saturday to search the Hudson River for the passengers of a mid-air collision between a helicopter and a small plane near Pier 40. The Coast Guard suspended its search for the passengers at 8 p.m.. Coast Guard cutter Penobscot Bay crew remained on scene overnight enforcing a two mile safety zone from the Holland Tunnel to the Lincoln Tunnel. Boast were required to transit slowly within 400 yards of the Manhattan side while passing through the area. Five rescue boat crews from Coast Guard Station New York, a Coast Guard rescue helicopter crew from Coast Guard Air Station Atlantic City, and several Coast Guard Auxiliary vessels were working with the New York City Police and Fire Departments in the recovery effort. The U.S. Army Corps of Engineers scanned the area with a side-scanning sonar to locate the wreckage. Early in the evening the helicopter was located. However the aircraft had not been located. U.S. Senator, Charles Schumer reacted to Saturday's fatal crash by renewing a call for tighter restrictions on the Hudson River corridor air space. In July 2007, Liberty Helicopter Sightseeing Tours sightseeing helicopter crashed into the Hudson River between midtown and Weehawken, N.J. None of the eight people on board were injured after experiencing a reduction of main rotor RPM. There have been 120 midair collisions since 1999 and of those, 63 were fatal, killing 162 people. On Sunday morning the U.S. Army Corps of Engineers brought in a barge with a crane to pull the helicopter wreckage out of the water. The river's strong currents and poor visibility hampered divers' efforts to recover the bodies and wreckage of the aircraft. National Transportation Safety Board Chairman Debbie Hersman said a nearby helicopter pilot saw the plane approaching the in-flight helicopter and tried to alert his fellow pilot. He radioed the doomed helicopter and said, “You have a fixed-wing behind you,” but there was no response from the pilot, Hersman said. 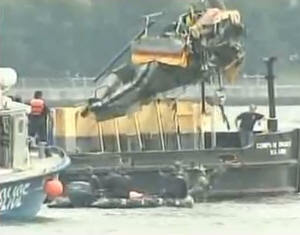 The pilot then saw the plane’s right wing clip the helicopter, and both aircraft split apart and fell into the river. Investigators are looking through a number of photos and a video taken by onlookers at the time of the accident. One onlooker was able to take a video of the helicopter and aircraft at the time of impact. The barge and crane, that was brought in by the U.S. Army Corps of Engineers was able lift the twisted wreckage of the helicopter from 30 feet of water by mid day. Their sonar scanner located the wreckage of the the small plane in about 50 feet of water. Recovery operations were halted at about 6 PM Sunday and will resume on Monday morning. Seven of the nine victims have been recovered and on Monday the focal point will be the recovery of the remaining two bodies and the aircraft. On Monday divers located the aircraft in 60 feet of water and upon inspection they discovered another body inside the aircraft. However, divers were unable to dislodge the body from the wreckage. Police say the plane was found on its side with no wings visible. Recovery efforts will resume on Tuesday. A collision avoidance system and or parachute deployment system might just have saved lives in the midair collision over the Hudson. BRS Aerospace (commonly known as BRS or Ballistic Recovery Systems) is a company that began research into a parachute deployment system in which a parachute could be deployed form an aircraft, bringing the occupants safely to earth, in the event the aircraft was unable to land under its own power or configuration. Both aircraft and helicopter were operating below 1,100 feet. Under current FAA regulation aircraft operating below that attitude and within that corridor are allow to operate without without ATC assistance. Rep. Michael McMahon has asked a House committee to press for more restrictions for the low flying aircraft over the Hudson. National Transportation Safety Board Chairman Debbie Hersman said investigators are reviewing the sequence of communications that took place just prior to the deadly collision. Air traffic controllers at Teterboro Airport, New Jersey were in touch with Steven Altman, pilot of the Piper Lance, moments before the crash. As Altman continued on his route, south along the Hudson, a Teterboro air traffic controll advised him to contact Newark Liberty International Airport on a different radio frequency. Newark controllers never heard from Mr. Altman. Bologna, Italy Magistrates, Luigi Persico and Morena Plazzi have opened an inquiry into this midair accident in an effort to seek to determine exactly what happened and whether anyone can be held responsible. "It is normal to hold an inquiry when any Italian citizen abroad has been a victim of an accident, said Italian Ambassador, Giovanni Castellaneta. 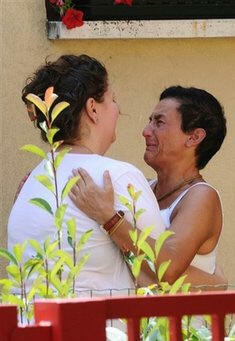 Silvia Norelli, wife who lost her husband Michele Norelli and son Filippo Norelli age 16, in the midair collision, arrived in Bologna on Monday. She was greeted by news reporters. Silvia Norelli expressed her anger before reporters, “ I dropped my family at the Liberty Helicopters tour, but didn't witness the crash. I didn't see anything. I want to know everything. I want there to be a full investigation. It's not possible that such things should happen." Siliva Norelli was also due to take the copter ride, which was a 25th wedding anniversary gift but, according to reports, decided against it as the helicopter frightened her. On Tuesday, divers recovered the last two bodies from Hudson River. Paul Browne, police spokesman said investigators believe the bodies were those of the pilot of the Piper Lance and a passenger. About 4:30 PM, the Army Corps of Engineers positioned their barge equipped with a large crane and hoisted the aircraft to the surface. 15 members of Congress sent off a letter to the FAA administrator requesting the place immediate restriction restrictions on New York City's airspace along the river below 1,100 feet. The group was spearheaded by Rep. Jerrold Nadler (D-Manhattan), the Northeast's highest-ranking member of the House Transportation Committee. On Thursday, the Federal Aviation Administration has placed 2 employees on administrative leave in connection with the Hudson River midair collision. The controller who had already turned over responsibility to controllers at a nearby airport was placed on administrative leave for making personal telephone calls at the time of the collision. His supervisor supervisor was also suspended for not being at the control center in Teterboro, New Jersey, as required. The FAA said they did not believe the actions of both men did not contribute to the accident. Friday morning services were held at Temple Sinai in Dresher, Pennsylvania for the three victims killed in the single engine airplane, pilot Steven Altman, his brother Daniel and Daniel's teenage son Douglas. On Friday the Federal Aviation Administration convened a New York Airspace Working Group that will review current operating procedures over the Hudson and East Rivers and recommend safety improvements in two weeks to FAA Administrator Randy Babbitt. NTSB Issues Update On Its Investigation Into The Midair Collision Over The Hudson River. On August 17, 2009, the National Air Traffic Controllers Association released a press release: WASHINGTON – Air traffic controllers today are strongly disputing misleading and – in one passage – outright false parts of Friday’s NTSB Hudson River mid-air crash press release that mistakenly and unfairly assign responsibilities to a Teterboro, N.J., controller during the pre-crash sequence of events that simply did not exist. At issue are four words in the NTSB press release that wrongly infer that the Teterboro controller could have warned the pilot of the Piper aircraft about the helicopter over the Hudson River that the aircraft eventually hit. The press release infers that at the time the Teterboro controller told the aircraft to switch his frequency to talk to Newark Tower controllers, there were several aircraft detected by radar in the area immediately ahead of the airplane, “including the accident helicopter.” NATCA emphatically declares that these four words are absolutely false and have contributed to the reckless and mistaken conclusion that the Teterboro controller could have prevented this crash. The same NTSB press release clearly states that the helicopter did not show on radar until 1152.27, seven seconds after communication with the aircraft was switched from Teterboro to Newark at 1152.20. But the poorly written and misleading passage about the “accident helicopter” has left the mistaken impression that the Teterboro controller was responsible for not warning the aircraft about that traffic. “We believe the NTSB is wrong to infer there was a traffic advisory that could have been issued from Teterboro Tower to the aircraft,” said Ray Adams, NATCA Facility Representative at Newark Tower who is representing the Teterboro Tower controller in the NTSB crash investigation. “The helicopter was not depicted on the radar prior to the switch of control from Teterboro to Newark Tower. Teterboro had no opportunity to call that traffic. The service of air traffic control is based on "known and observed" traffic. The Teterboro controller had neither seen nor known about the accident helicopter at the transfer of communication to Newark. Added NATCA President Patrick Forrey: “Let me make this as clear as I can: our air traffic controller at Teterboro did his job. We believe he is not responsible for contributing to this tragic accident and there is nothing he could have done to prevent it from happening. We respect the NTSB and we value our participation in NTSB investigations. But in this case, the NTSB has completely ignored our input, painted an unrealistic view of the job description of a Teterboro controller and fueled a public feeding frenzy that unfairly blames this particular Teterboro controller for not acting to stop the sequence of events that led to the crash.